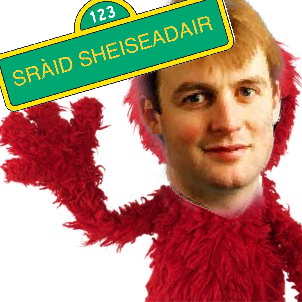 The Labour Party in the Western Isles are attempting to win back the Na h-Eileanan An Iar with the launch of a new educational children’s programme, Seiseadar Street. Set in the crofting socialist heartland of Point, it will follow the adventures of Parliamentary Candidate Alison MacCorquodale, a bright young human from Uist as she learns good Rubhach Gaelic, whilst teaching young viewers the tenets of socialism, the words to the Red Flag and how to get past AB in the alphabet by various local characters portrayed by characters created especially by Buth-obrach Telly na Cloinne. One firm favourite will be the adorable Almo, who Alison will learn from his own struggles with getting past AB. There will also be other quirky political characters; brothers Bert & Ernie Crichton, Grover MacSween, and Wilson the Grouch who lives in a dustbin named Uig and pops up from time to time to moan about everyone else but especially the SNP on Fraggle Rock. “The best collection of Gaelic puppets since Mire Mara” said a spokesperson. The Party have also launched the Tickle-Me-Almo doll to cash in on the noughties nostalgia boom. If you rub its belly it will sing a Rangers song or give a soundbite about the benefits of Wind Power.